An ancient curse from the past is feasting on a special race of people known as the “Enforce Race”. Why are these people dying and why have they been chosen? Now (present day) with an extreme amount of Enforcers missing the people want answers. They are tired of their forefather’s mythology. The Enforce Council feels they have found the problem and sends out their armed forces to eradicate it. What they discover leads to an “All Out War”! I was made aware of this comic-book thanks to the World of Black Heroes blog, who listed it in 13 Comics to Read in 2013- Indy Edition. I was intrigued enough to buy it myself, and boy am I glad that I did! 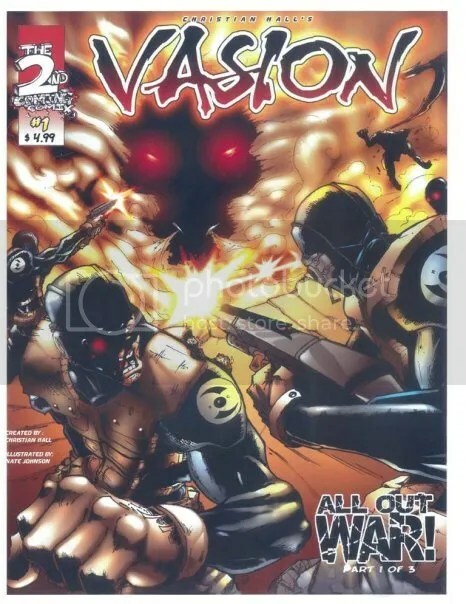 Written by Christian Hall (who also created it) and drawn by Nate Johnson & The N.J. Comix Entertainment Group, this 3 issue miniseries is non-stop action, as a group of special military men use high-tech weaponry to try to take down a colossal wolf-like beast, that seems to be straight out of the pits of Hell. Hall’s scripting is concise, and Johnson’s artwork is fantastic. I thoroughly enjoyed it, and hope to see more in the future. The complete miniseries can be purchased via Hall’s website, http://2ndcomingcomix.net/, where if you purchase issue #2 and #3 together ($4.99 each), you also get #1 for free. So that works out to about $3.30 an issue for the complete set. And it’s CHACEBOOK-approved, with a rating of 4 STARS! So go cop that!